Spiders are one of the most dreaded and feared of pests that can occupy the home, and a common cause of the request for pest control in Fort Worth. The fear is not without reason. If a black widow or a brown recluse bites you, you can end up in the hospital. Controlling the spider’s food sources around your home is an essential component in preventing them in the home, along with routine pest control in Fort Worth. professional pest control in Fort Worth for your home. Not all spiders have the same habits. Numerous spiders will spend their lifetime on a web, and these can only be killed by direct contact with a pesticide, or your weapon of choice such as a rolled up magazine. Most web spiders let the prey come to them, and like to build webs near sources of light where flying insects are attracted. Hunting spiders on the other hand will run their prey down. These too have a variety of members, such as the jumping spider with its short stubby legs. Spiders with sturdy, long legs are the runners. This group includes the brown recluse spiders and the wolf spiders, for example. These spiders do not spin a web, and spraying the cracks and crevices they frequent will expose them to the chemical if its body contacts it. Contact The Bug Dude for pest control in Fort Worth. Spiders are often stealthy little predators. Some hang out in quiet, dark areas, such as a closet or pantry, while others travel along walls, beside, or behind furniture, between a headboard and wall. These frequented areas are the location of choice for placing glue traps, but a heavy infestation will require professional pest control in Fort Worth. Carefully inspect your home for cracks, crevices, and gaps where spiders or other pests can enter. Common sites are around windows, doors, poorly aligned outlet covers, cracks between the wall and ceiling, cracks in the basement wall and gaps around cables, and pipe entering through walls or the floor. Seal these areas with the appropriate caulking or expanding foam. Please note, sealing of heated exhaust pipes, such as a furnace, wood heater or gas water heater require specialized heat tolerant sealant. Remove piles of papers, boxes, bags, and other clutter in the home to reduce potential nesting areas. Frequent vacuuming and sweeping of corners, closets, basements and other undisturbed will assist in reducing spiders in the home. Ensure to remove egg sacs to prevent additional spiders. Our specialists can identify your pest problem, including spiders, and provide the appropriate pest control in Fort Worth. Spiders tend to spin their webs in quiet, undisturbed, and secluded areas. Replacing standard outdoor mercury vapor lights with high-pressure sodium vapor, halogen, or LED lighting will reduce the amount of flying insects that attract spiders. Contact The Bug Dude for professional pest control in Fort Worth. Though the black widow is the recognized arachnid for eating its mate after mating, most spider species share the same trait. Female spiders are typically larger than males of the same species, and when hungry, will eat any invertebrate including potential mates. approaching. Jumping spiders perform elaborate dances from a safe distance, and wait for a signal from the female. The female Wolf spider carries her egg cocoon, holding it to her body. During the night, she leaves the sac in the tunnel while she hunts, and brings it into the sun during the day to warm the eggs. Once baby wolf spiders hatch, they cling to their mothers back after hatching until they are large enough to be on their own. There are approximately 200 types of wolf spiders in North America. are black. In the U.S., there is also a brown widow and a red widow. While almost all black widow spiders have a bright red or orange hourglass shaped marking on the underside of their abdomens, the red widow Lactrodectus bishop, does not have the marking. cramps, severe pain, hypertension, weakness, and sweating. If you are bitten by a black widow, medical attention is required. Widows are a prolific species. During her lifetime, she may produce 15 egg sacs, with up to 900 eggs in each one. 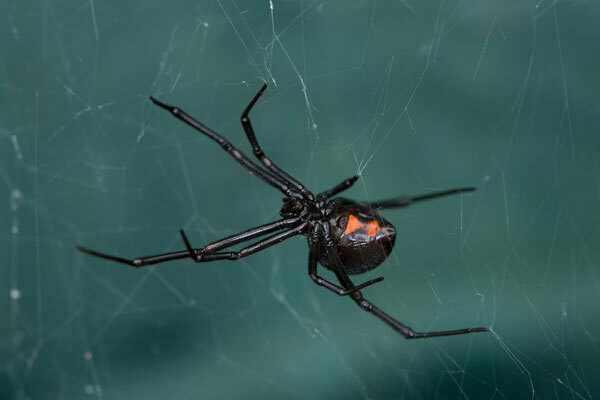 A black widow population in the home should be treated with pest control in Fort Worth. If you have spiders or other pests in your home, contact The Bug Dude for professional pest control in Fort Worth. The Bug Dude has the latest knowledge, tools, and equipment to safely deal with your home’s pest issues.